I’m wondering what all of you are grateful for today? I’m also wondering what you want to be grateful for a year from now? What changes can you make now to create the abundance that you desire? "It's the little things" how cliche right? But OH so true! Teaching my 5:45am class is not only one of the hardest things I do because it's really difficult to get up between 4-4:30am, but it also happens to be one of my favorite things in the world. Why? Because the stillness of the morning is beautiful beyond words. The stillness of the morning is not tangible, I can't hold it, touch it, or buy it, the only thing I can do is be present for it. If I wake up that is. This is why I teach a 5:45am yoga class. It's not because it's profitable, it's not because lots of people want to come to a 5:45am class, it's because for me that's where the magic happens. Getting up and getting out of bed for myself in the wee hours of daytime is difficult. It's difficult and if I'm trying to wake up just for myself, I'll normally flake, but if I'm meeting someone or teaching a class I'll be there. This is a mind trick I use to get out of bed in the early mornings. I make myself teach a class, I make myself set an appointment to meet a friend to run or walk for an hour. This way I know I'll build in time to experience the stillness. Have you ever noticed if you wake up early to go run before work when it's still dark outside, even if you are working hard, running hard, riding hard, doing hard yoga, you find everything around you in stillness? It's like magic. I want the magic of the morning in my life. What do you do when the bed is warm and inviting to leave it in the wee hours? What are the little things in your life that you can't necessarily hold, or touch, or buy that bring you utter joy and peace of mind? For me there are lots of lovely little things that make this journey of life worth it, and I'm trying to keep my focus there. Life is currently upside down and tumultuous. Despite that fact I know that if I focus on the little things that ARE truly wonderful, then I can know in my heart center that even in the middle of unpleasant moments there is a light. See that smile? It's a moment of Joy. My wish for you is that you feel joy and happiness, that you feel at least feel a little bit everyday. Sometimes, it's hard to find joy or happiness. Sometimes it feels like the joy and happiness is hiding and you might not even have any idea where to look for it. The consistent bleating daily grind can feel like it's beating you down (I know), but try to find the moments to stop and feel truly present. Where do I find moments of joy? Last night for instance, in a warm tiny room full of yoga students, getting to lead them through sun salutations, helping them get a little more in touch with their bodies. Reminding them that there is joy in the moment, reminding them to smile. That was my moment of joy yesterday. Going home at lunch time and giving my dogs little scratches as the wagged their cute tails, that was my moment of joy. Where do you find moments of joy? Do they make your gratitude list? Tell me about what brings you joy. Yesterday after coming clean to you that I'm not always a being of enlightened sunshine I felt better. Some times you just need to knowledge the rough patch to be able to move through it. Don't let your rut become Chronic. The Quote up above was sent to me via face book from a friend who read yesterday's post. I think it rings true. Cultivate your own joy, cultivate your own happiness, it takes work like everything else. I also found inspiration from Tammy Stroble's Blog post yesterday and I wanted to share with you what I'm grateful for. 4)I'm grateful for my health able body. 6) I'm grateful for being a yoga teacher and getting to share yoga with my community. My list could go on, but I'll spare you the rest. 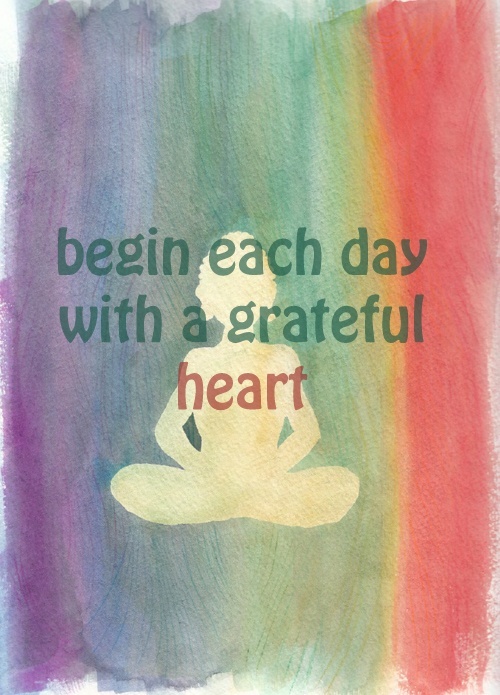 What are you grateful for today? I encourage you to take 5 minutes, stop what you are doing and physically write it out. It will make a difference. *P.S. Did I mention I saw a shooting star at the end of my 4 mile run this morning? It was glorious, just like you.